Students as Designers: Game Jams! The game jam (a game about making a game) is a hands-on model for inspiring student creativity, collaboration, and sense of accomplishment. Game jams have been growing in popularity across college campuses and in out-of-school programs. In a game jam, teams are challenged to design a game in a short period of time. Often, there is a theme, like making a game about math or environmental problems. This April, the Now I Get It Jam took place at Carnegie Mellon University. It had a "transformative" (social impact) theme that included teachers in the design process. Challenges for the weekend-long event included "Human-Centered Design for Teens" and "Common Core Math for Parents." 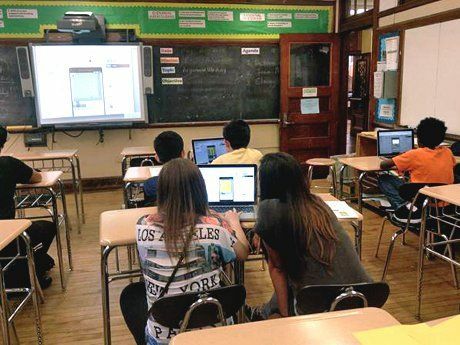 In autumn 2014, the White House Education Game Jam invited developers, educators, students, and academics to participate. In March 2015, the U.S. Office of Ed Tech followed up at the Austin Game Jam. Check out the trailer for The Mystery of the Ancient Doohickey, a math game created at the event. In essence, game jams are a game about making a game. I've used the model to have my students create board games about events during the American Revolution. It focused learning, while at the same time increasing the engagement from students. The culmination of student work was not a presentation. Rather, it was a playable system for others to experience and offer feedback. [The Moveable Game Jam] is a great place for middle and high school students to share projects that they've been working on, whether it's a game, story, robot, or anything else. This past school year, the Moveable Game Jam was held at eight New York City locations, including the Museum of the Moving Image. Twelve different organizations participated in the initiative. The activities are regularly iterated, updated, and openly shared on the Moveable Game Jam Guide. The document is an invaluable resource for anyone who wants to teach a topic using this innovative format. For more about parts of games, see the Institute of Play’s Q Games & Learning Design Pack. Next, the whole group participated in a warm-up. Smaller groups of students split into teams of 3-4 and created a game with specifics tied to each if the five aspects listed above. The goal was to get points in the space of a room using at least hands, feet, or paper as a component. The mechanics were catching, guessing, or walking. Game rules were open to student choice. After 15 minutes, students were given the opportunity to share out their creations. What struck me as impactful was the variety of student outcomes. Each was unique -- groups interpreted the directions differently and were unafraid to fail. 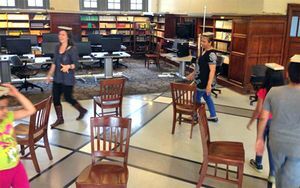 Some made games about paper airplanes, while others used the paper to create variations of Easter egg hunts in the library. The main part of the game jam took place in four classrooms. Volunteers from Iridescent, the Institute of Play, and CoderDojoNYC were among the station leaders. I could envision this set-up in learning centers in my classroom, each tied to a specific goal and challenge. The Moveable Game Jam stations took one hour each (students were free to move from location to location, if desired). Each activity was different in its modality -- participants were definitely not staring at screens. Some were digital, some were physical, and most combined the real world with the virtual. One station was completely non-digital: modding (modifying) musical chairs. Another involved making a Maze Runner-style adventure game using Appmaker, a free authoring tool from Mozilla that mimics a smartphone device (many of Mozilla’s educational tools can now be found on a new online portal). Across the hall, participants drew game levels on special graph paper. The hand-drawn images were scanned by iPad camera into Pixel Press' Floors application. The result became a side-scrolling video game (think: Super Mario Bros.) that sprang to life from the participant's page! The fourth event took place out in the hallway: robot wars. Students operated Sphero's rolling robots through an obstacle course. Also included were Cubelet interconnecting robot blocks. The event concluded with time to share, showcasing student designs for others to see and experience. Participants at the Quest-hosted jam -- many of whom were strangers at the start -- bonded over the process of collaboration. There was also a true maker spirit of invention. The Moveable Game Jam gave each participant an opportunity to create, test, fail, and iterate -- all while having fun! It is definitely something worth adding to a game-based or project-based classroom to inspire meaningful learning. Have your students ever participated in a game jam or something similar? Please tell us about it below.